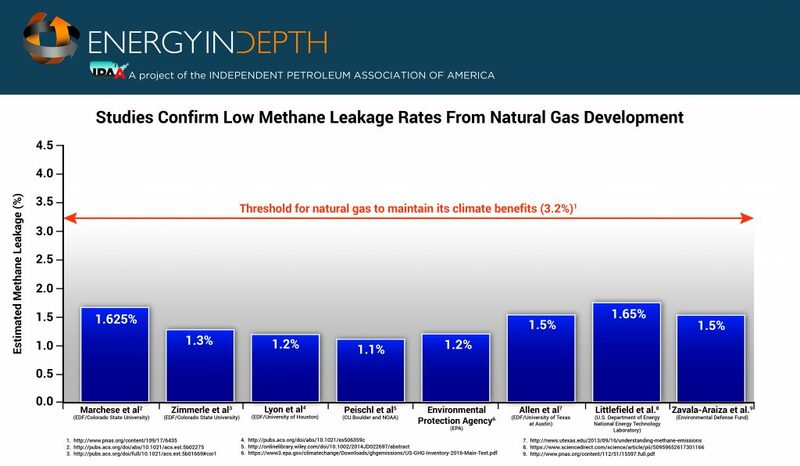 The Environmental Defense Fund (EDF) has released a myriad of studies on natural gas system methane emissions over the past six years that have found low leakage rates between 1.2 and 1.5 percent of production. Five such studies are featured in the following EID graphic. So the fact that a new EDF study released today finds methane leakage rates of 2.3 percent — well above what EDF-led research has previously found and “60 percent higher than the U.S. EPA inventory estimate,” according to the report — begs the question: What changed with regard to EDF’s methodology for this study that yielded a much higher leakage estimate than its past research has shown? Turns out, quite a lot changed, and most of the changes raise red flags regarding the study’s conclusions. Not only did the authors of the new EDF study — which includes no new measurements and instead calculates national methane emissions based on past studies — opt not to use past EDF research as a basis for their emissions calculations, it relies exclusively on five far less comprehensive facility-level studies that lacked industry participation to arrive at its conclusion of higher U.S. emissions than previously reported. In contrast, an “alternative” calculation, based partially on EDF’s past studies, that finds emissions in line with current EPA estimates is buried in the study’s supplemental data and is not even mentioned in the report. These are just two of several key issues regarding the manner in which EDF conducted this study that appear aimed at producing the most extreme emissions estimate possible ahead of the 27th annual World Gas Conference (WGC), which begins Monday in Washington, DC. Here is a deeper look at each issue. EDF has conducted studies combining the comprehensive top-down/bottom-up methods recommended by NAS before. Zavala-Araiza et al. is the most notable example, and that study found a methane leakage rate of just 1.5 percent. Just as notably, a recent National Energy Technology Laboratory study based on Zavala-Araiza et al. data estimates national methane emissions at 1.65 percent. That report involved several of the co-authors of this most recent EDF study that reached much different conclusions. The new EDF report argues that using facility-level measurements exclusively is appropriate because component-based studies can “under-sample abnormal operating conditions” such as malfunctions and large leaks. But this rationale ignores flaws with facility-level measurements that can lead to overestimation of emissions. For instance, facility-level measurements can capture episodic emissions, such as liquids unloading, and inaccurately characterize them as normal emissions that would be occurring 24 hours a day, seven days a week. The latter issue can be exacerbated when researchers lack a fundamental understanding of the facilities where they are taking measurements, which brings us to the next major issue with the study. Not only does EDF fail to provide a single reference to back up this claim of “potential bias” that it claims necessitated it to use the methodology highlighted above, but none of the five co-authors of this report, who were also the lead authors of past EDF methane research that was conducted in close concert with industry ,have ever publicly claimed any “bias” whatsoever. Not once. EDF’s assertion appears to be purely speculative in nature and also appears to be an excuse to use these studies as a basis for exaggerated national emission estimates. In the supplemental materials document for this report, EDF includes the following “alternative” national emissions estimates based on source-based reports, several of which are past EDF studies. This “alternative” estimate finds the national methane leakage rate is 1.4 percent, which (not surprisingly) not only aligns with past EDF studies, but also the EPA Greenhouse Gas Inventory. 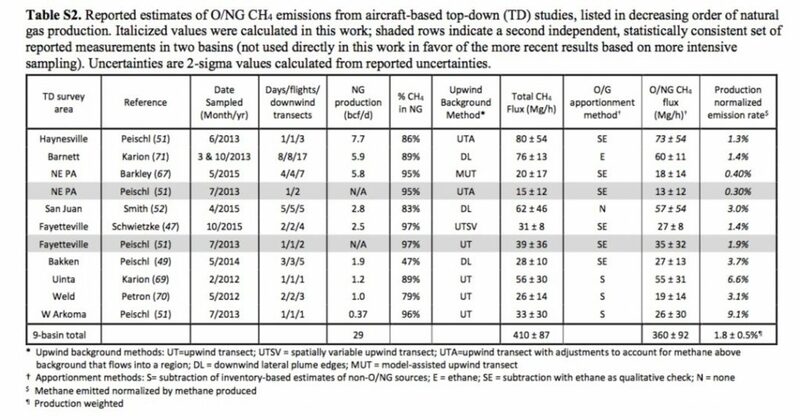 EDF also argues that its “primary” estimate — which, again, is based solely on facility-level studies — is in line with aggregate average emissions found in the following nine “top-down” studies based on emission measurements largely collected via aircraft measurements. But this claim is a stretch on a couple levels. First, the cumulative data from the above “top-down” studies show a national leakage rate of 1.8 percent, well below the 2.3 percent leakage rate this new EDF study claims. Though that is within the study’s .5 percent uncertainty range, top-down studies typically overestimate oil and gas methane emissions due to the fact that emissions measurements from such studies are difficult to attribute to specific sources. In other words, it is highly implausible that “bottom-up” methane emissions estimates would be higher than “top-down” estimates. And in fact, a recent National Oceanic Administration (NOAA) study finds that top-down studies have likely overestimated emissions by mischaracterizing episodic emissions as normal emissions. Such emissions can also be detected and mischaracterized via facility-level measurements. So it’s not surprising that this EDF study tries to discredit that NOAA study. Another factor that can lead to facility-scale measurements overestimating actual normal emissions is the fact that such methods are conducted in the daytime and, thus, can capture emissions from episodic events — such as liquids unloading — that are conducted during the day and inaccurately extrapolate them as if they are constant. This fact was further confirmed by a recent peer-reviewed NOAA study of the Fayetteville Shale covered by EID last year. The above claim is directly contradicted by the following, which acknowledges the validity of the NOAA Fayetteville study, but claims it isn’t relevant to other basins. The fact is, events such as liquid unloadings are common in other basins and downwind measurements, such as the ones used as the basis for this EDF analysis, do tend to be higher because they are conducted during the day. But as alarming as that claim might be, it is essential to note that natural gas maintains clear climate benefits over other traditional sources even at much higher leakage rates than purported by this study. 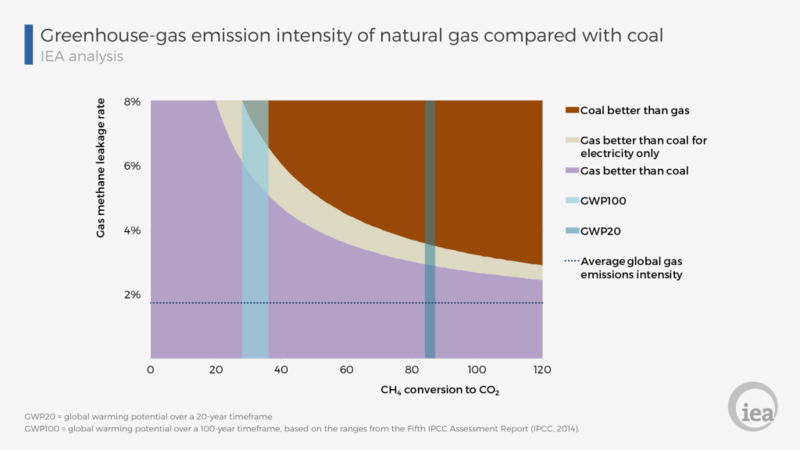 The following International Energy Agency (IEA) graphic illustrates RFF’s point, showing natural gas maintains its climate benefits even at high leakage rates and regardless of time-frame considered. This EDF study spends an inordinate amount of time explaining why its conclusions are plausible rather than explaining how it reached its conclusions. And it’s clear why — once one digs into the report’s supplemental information, it’s clear that the conclusions are based on some pretty shaky assumptions and speculation that runs counter to established and/or recommended best practices for such research. But at the end of the day, the EDF study is not only an outlier in terms of the overall body of current methane research — it’s also an outlier with regard to EDF’s collective methane research, which has consistently found leakage rates between 1.2 and 1.5 percent. In the meantime, EPA data show oil and gas methane emissions have declined 14 percent since 1990 even as oil and natural gas production have skyrocketed. Combined with the fact that increased natural gas use has helped contribute to the best air quality of the modern era and the lowest carbon emissions in 25 years, it is clear that the shale revolution has been a win-win for the economy and environment.